We went for the Attack on Titan: Castle Under Siege room. It was amazing! This was my first escape room but definitely won't be my last. They gave us matching themed capes which was awesome and helped the team spirit feel/authenticity of being part of the story line. I couldn't for the life of me fathom how they would incorporate puzzles into the AoT story line, but they executed it flawlessly! The props and room layout were very nice and the puzzles were just hard enough that we had to think but not so difficult that we couldn't eventually figure them out (a few with trial and error, but we got them in the end)! We had a few people bail on us last minute so there were only 5 people in our group, but in my opinion it was the perfect amount. We were all able to work on different simple things and yet also come together for the more difficult puzzle aspects. We finished in about 45 min which was great as we beat the room but didn't beat it so fast that it felt too easy. Definitely recommend fellow AoT fans to go while they can. You are a proud member of the Survey Corps, the “hope of mankind.” One day, while surveying outside of the wall, your division is attacked by a group of Titans. With only a few of you left, your division has nearly fallen. Those of you who survived barely made it into a ruined castle before being surrounded by Titans. As the building shakes from the Titans unmerciful attacks, the walls begin to crumble. If you don’t do something, you will be eaten. You have 1 hour until the Titans destroy the castle ruins. You must work together with the rest of your surviving team and escape this despair. 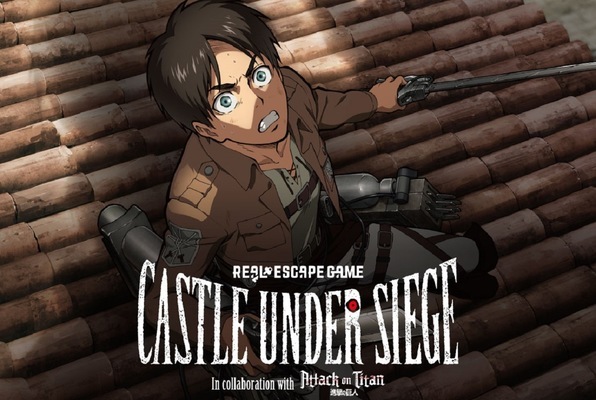 Reviews of escape game "Castle Under Siege"
We did the "Attack on Titan" escape room and it was so much fun! We had 8 of us total which was a perfect size. They do a good job of making sure that you can still play the game even if you haven't seen the show (we had 1 person in our group who didn't know the show at all, but still had a blast). The staff was all very nice, enthusiastic, and kind. They had Wings of Freedom capes for us all to wear, so we really felt immersed in the world. Definitely a good activity for team building - working together always helps. I had never done an escape room before (I always kind of nervous that they would be too scary) but this one was much more like a logic puzzle (nothing jumping out at you or anything). This review is for the Attack on Titan: Castle Under Siege, and will be my 9th room overall. I LOVED this room. I came with 8 of my friends since we booked the entire time slot. They open 10 minutes before each time slot since they close up to reset their rooms. I'm kind of glad they dedicate a reset time, since the rooms and clues are so intricate. Great staff (shout out to Evan and Larose for being so wonderful), great immersion factor, and a cohesive story to it puts this room at a 5/5 in my book. ALSO I love the fact that they added the capes! This was my 2nd escape room and my boyfriend's 1st ever escape room, and we did the Attack on Titan: Castle Under Siege. It was fantastic! We loved the immersion: the story is great, and you have a person inside with you as an actor for the story and as someone who gives hints. It was definitely challenging, especially since we were a group of only 2 people, but not too difficult! The capes were definitely cool. I don't want to talk too much about it since it might be spoilers. The staff are amazing; shoutout to Evan and our guide inside the escape room!